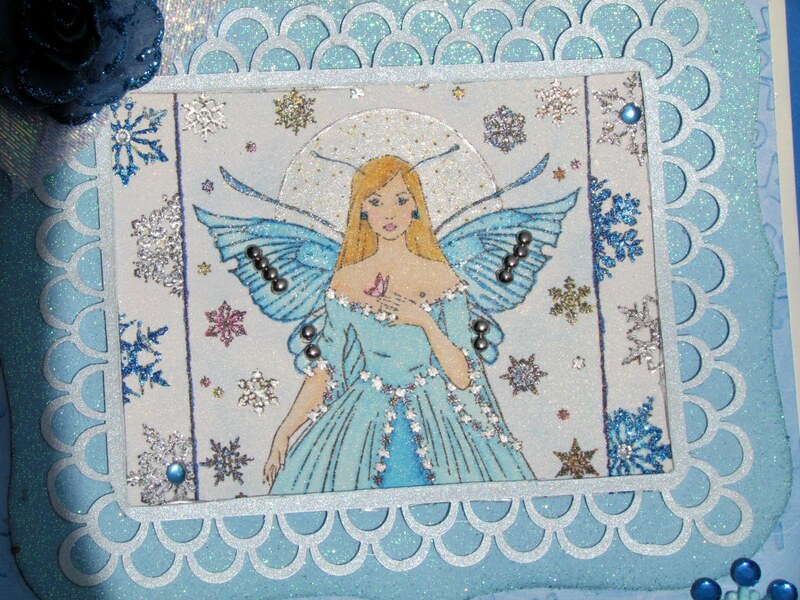 This beautiful angel is from Sweet Pea stamp's Rachel Anderson collection, called Snow Fae. Colored in Copics. 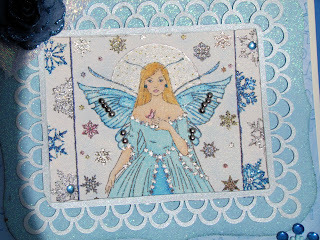 The snowflakes are outlined in glitter pens and blinged up with rhinestones and crystals. Corner flower is made from a Paper Studio punch and glittered on the edges with mother of pearl leaves added. If you ever wondered if there could be too much glitter...the answer is no. This little lady is glittered, glitter penned and finally sprayed with glitter mist. Ahh, shine on!! This is just so lovely, Dorinda. I love the icy blue. The fairy is gorgeous as are the other elements you included. The end result is a wonderful card! Thank you for joining us at Hooked on Craft Challenges! Thanks for sharing your creativity at the Simon Says Stamp Challenge!!! Oh this is lovely :) Gorgeous image and really awesome cool colours. Gorgeous! 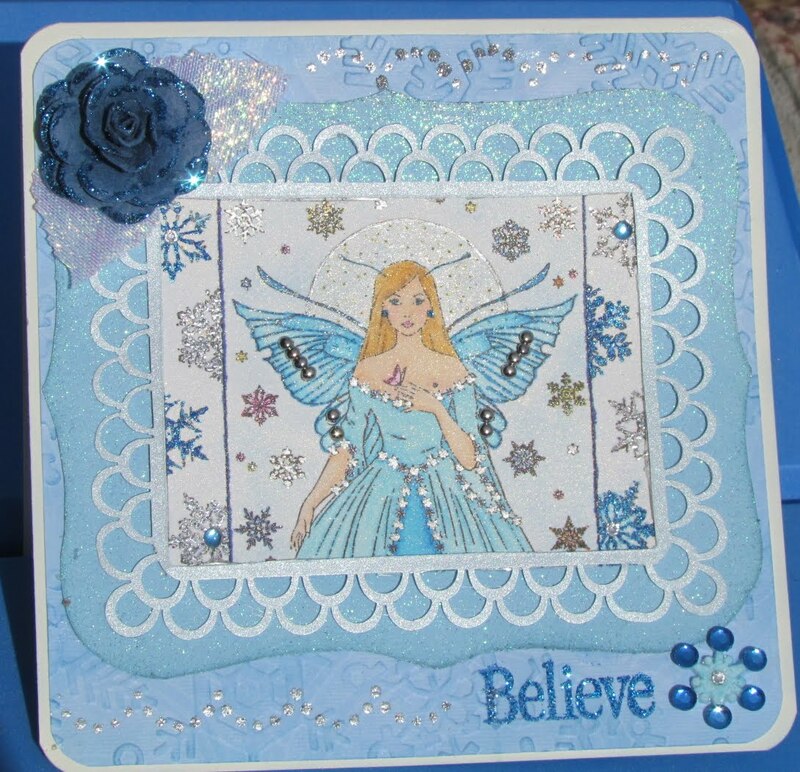 Love the sparkle and that pretty fairy!! 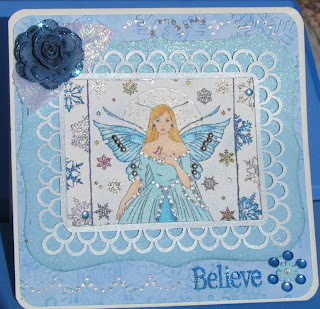 Thank You For Joining Paper Creations Ink; We Always Enjoy Seeing Your Creative Talents! Have A Wonderful Holiday Season! She is lovely and what a yummy shade of blue. This looks stunning. Such a beautiful image with gorgeous detail. Thanks for joining us at Creative Card Crew. You did not win on this occasion hope you can join us for the next challenge starting soon.